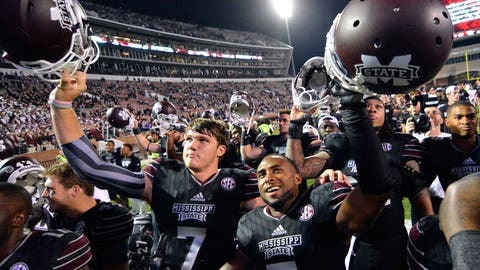 Mississippi State is a quiet 6-2 on the season after the big win. After earning wins last weekend, Alabama and LSU are now officially set to meet Nov. 7 in Tuscaloosa in a game that will likely determine the champion of the SEC West. But before we get to that showdown in two weeks, time to recap another weekend of SEC games. Arkansas kept its bowl hopes alive by winning in a 54-46 four overtime thriller against Auburn. The Tigers will now need an upset down the stretch or they will be home for the postseason. Thanks to two Derrick Henry rushing touchdowns, Alabama won its ninth straight contest against Tennessee in a 19-14 win. The season is in danger of falling apart for Texas A&M, as its offense was pathetic on the road in Oxford in a 23-3 loss to Ole Miss. Dak Prescott accounted for six touchdowns in a 42-16 win at home over Kentucky. Following another promising start to the season, the Wildcats are in danger of letting another season slip out of control. LSU slept walked through much of its game against Western Kentucky but ultimately prevailed by a dominant 48-20 margin. Brandon Harris had a career game, throwing for 286 yards in the win. And finally, Vanderbilt earned Derek Mason his first SEC victory of his career by beating Missouri 10-7 at home. The Tigers have not scored an offensive touchdown since Oct. 3.